Rudy Giuliani came to London. Fred Thompson and Bill Clinton too. The British capital has become a favorite destination for presidential hopefuls or their spouses seeking campaign contributions from Americans overseas and - perhaps more importantly - to show the folks back home they can hold their own on the international stage. Having your photo taken with Margaret Thatcher or waxing eloquent about the trans-Atlantic "special relationship" at fundraising events is increasingly being seen as a way to cultivate presidential allure. 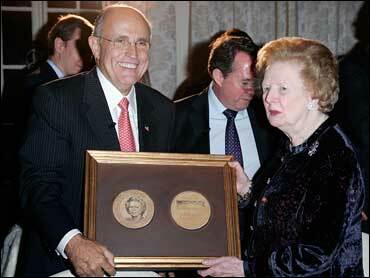 Giuliani and fellow Republican Thompson turned visits to Britain into ideological pilgrimages by visiting Thatcher, an icon among American conservatives. Neither Giuliani, the former mayor of New York, nor Thompson, who served as senator from Tennessee, have much in the way of direct foreign policy experience. Conservative British think tanks have given both a foreign - but friendly - platform to articulate their respective international agendas. "It's about establishing some kind of credentials at home, in the United States, by showing that they are beloved - or at least recognized - when they're abroad," said Ivo Daalder, a senior fellow at the Brookings Institute. "The only place they can think about going and, frankly, the only place in which Republicans, at this point in time, can expect a non-hostile audience, would be in right-wing, Tory parts of London." Beyond burnishing their foreign policy credentials, Republicans and Democrats alike see the British capital as a fertile source for funds. "Presidential candidates are a bit like bank robbers," said Massie Ritsch of the Center for Responsive Politics, a non-partisan group in Washington that tracks campaign donations. "They go where the money is, and clearly there is a lot of money to be found in London and other financial centers where Americans are living." Barack Obama's wife, Michelle, is the latest spouse to visit, traveling to London on Monday for a fundraiser at a swank London hotel. Earlier this month, Democratic front-runner Hillary Rodham Clinton sent her husband, the former president, to raise money among the more than 250,000 Americans in Britain. Republican front-runner Giuliani and Democratic candidate Dennis Kucinich visited last month. Tickets for the Obama and Clinton receptions started at $1,000. Obama devotees who raise $23,000 can join the London event's host committee and be invited to a special pre-reception. "This is one place they consider good pickings," said William Barnard, chairman of Britain's chapter of Democrats Abroad. Although overseas contributions represent only a small amount of overall fundraising totals, the amounts are growing. Donations for the 2008 U.S. presidential campaign from Americans abroad totaled $474,000 in the first half of the year and are on track to exceed the $900,000 of the 2004 campaign, according to the Center for Responsive Politics. The courting may also be flattering to expatriates, who like the notion that the candidates are paying attention, Ritsch said. "It's a way for expats to participate," Ritsch said. "Sticking a sign in your yard in Tokyo is not going to do much. But making a contribution of $1,000 is helpful." Democratic candidates so far have fared slightly better overseas, raising some $286,350 to $187,700 for Republicans, the center said. It isn't just about money. Tight elections have underlined the potential importance of absentee overseas ballots. Democratic candidates have an added incentive: Overseas Democrats can influence the primaries. Democrats Abroad will hold an online vote during the primaries and will send 22 delegates to the party's national convention in August. Obama has been the most successful at raising money overseas: $194,250 in the first half of the year, followed by Giuliani with $119,450 and Clinton with $51,450.